The Constitution’s 21st Amendment gives states the power to regulate the distribution of alcohol into and within a state, while a doctrine known as the dormant commerce clause (derived from the Constitution’s commerce clause) bars states from discriminating against interstate commerce. Next week the Supreme Court will hear oral argument in a challenge to a Tennessee law that requires anyone who wants a retail license to sell alcohol in Tennessee to have lived there for at least two years. A federal appeals court ruled that the law violates the Constitution by discriminating against out-of-state residents. Defending the law, a trade association representing the state’s liquor retailers argues that the Constitution treats alcohol differently from other products, giving states broad powers to regulate it. At roughly the same time, Doug and Mary Ketchum left their home in Utah after doctors told them that the weather there was bad for the Ketchums’ disabled daughter. The family moved to Memphis to buy a liquor store, using their retirement savings, in the hope that owning their own business would give them more flexibility to care for their daughter. Tennessee’s Alcoholic Beverage Commission recommended that liquor licenses for both Total Wine and the Ketchums be approved, but the Tennessee Wine and Spirits Retailers Association – a trade association representing the state’s liquor retailers – threatened to sue the commission if it awarded the licenses, citing the residency requirement. The TABC went to federal district court, asking the judge to rule on whether the two-year requirement is constitutional. Both the state and the retailers argued that it is, but the district court disagreed. The retailers appealed to the U.S. Court of Appeals for the 6th Circuit. The TABC did not appeal, and it did not participate in the oral argument in the court of appeals, although it did file a brief supporting the residency requirement. Meanwhile, the Ketchums received a liquor license and bought a store in Memphis, while Total Wine opened a 30,000-square-foot store in Knoxville in June 2018. A divided panel of the 6th Circuit affirmed. It ruled that Tennessee’s two-year requirement discriminates against out-of-state residents and that the state could have achieved its goals of protecting the public welfare using other strategies – for example, requiring retailers to use a general manager who lives in Tennessee or regularly reviewing a retailer’s operations to make sure that it is following state laws. The retailers then went to the Supreme Court, which agreed last fall to hear the case. The retailers argue that the Supreme Court has distinguished between “core” state powers, which are protected by the 21st Amendment against suggestions that they violate the dormant commerce clause, and “non-core” powers, which are not protected. “Core” powers, the retailers explain, include the power to directly regulate sale or use of liquor within the state, while “non-core” powers try to regulate activity outside the state – for example, a ban on alcohol-related TV ads that are broadcast into the state from another state or laws that regulate prices in the state by comparison to prices at which alcohol is sold in other states. The two-year residency requirement at issue in this case, the retailers stress, is a core power: It directly regulates the sale of liquor within Tennessee, treating out-of-state liquor the same as domestic liquor. As a practical matter, the retailers continue, the requirement makes sense in several different ways. First, it gives state and local officials enough time to determine whether an applicant has the right character to have a liquor license. Second, it makes it more likely that the applicant will understand the needs of the community in which he plans to sell liquor. “The long-time resident who attends football games on Fridays is less likely to be duped by the drum major’s fake ID on Saturdays,” the retailers suggest. And more broadly, the retailers add, rules that make it harder to open a liquor store are generally good, because less liquor may help to reduce alcohol abuse. In its brief on the merits, Total Wine begins by stressing that Tennessee effectively has a 10-year residency requirement for people who want to own a liquor store in Tennessee: A first-time applicant must have lived in Tennessee for at least two years, but the one-year license “cannot be renewed unless the individual has been a Tennessee resident for ten years.” Total Wine takes it as a given that the residency requirement violates the dormant commerce clause: As Tennessee itself has acknowledged, the residency requirement prevents out-of-state residents from getting liquor licenses to protect Tennessee sellers from competition. The requirement, Total Wine says, is “so manifestly protectionist” that the state hasn’t enforced it for six years and has only filed a letter in the Supreme Court agreeing with the retailers. Instead, Total Wine observes, the group that is actively defending the residency requirement in the Supreme Court is the retailers themselves, who acknowledge that their right to sue comes from their interest in not having to compete with Total Wine and the Ketchums. 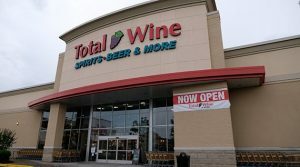 Total Wine questions the rationales that the retailers have offered in defense of the residency requirement. Applicants are not actually required to have any local ties to the community where they will open a store, Total Wine observes; it is enough that they live in Tennessee. “The notion that someone living in Memphis is more in touch with Knoxville than someone living in Asheville, North Carolina, which is 250 miles closer, is silly,” Total Wine posits. And in any event, the store’s general manager and employees who will “actually check IDs and make point-of-sale decisions” will live in the community, Total Wine emphasizes. Total Wine and the Ketchums also press a fallback position. Even if the Supreme Court were to agree with TWSRA, Total Wine suggests, the justices should send the case back for the lower courts to consider whether the residency requirement violates the Constitution’s privileges and immunities clause, which bars a state from treating nonresidents differently from residents. The Ketchums go a step further, noting that Tennessee’s residency requirement also “discriminate[s] against newly-arrived residents of Tennessee itself” – in conflict with the original understanding of the clause, which was to allow newly freed slaves to travel to find work and “be treated equally in their new states of residence” – and they urge the Supreme Court to decide the case on this ground if it disagrees with the 6th Circuit’s reasoning on the dormant commerce clause and the 21st Amendment.